Glen Leroy Huey (February 21, 2009) | Burmeister-Johannsen Funeral Home, Inc.
Glen Leroy Huey, the son of Glen B. and Velma Rose (Hiatt) Huey, was born on May 3, 1950, in Manning, Iowa. After graduating from Irwin (Iowa) High School In 1969, Leroy briefly attended Simpson College in Indianola, Iowa. He then began working for the University of Iowa Hospital as a cook; he later worked as an orderly and kitchen assistant for the Hospital. Leroy was employed there for 26 years before his health forced him to return home to be close to his parents. In 2006, Leroy became a resident of the Manning Plaza Nursing Home in Manning. Leroy grew up in the Methodist church and later attended the Mormon church for a number of years. He enjoyed Origami, and also loved eating his mother’s cooking and fishing at area lakes with his father. 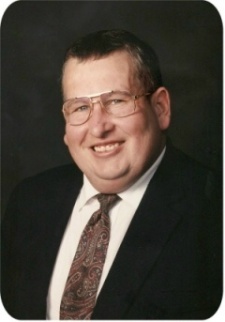 Leroy Huey died on Saturday, February 21, 2009, at the Manning Plaza Nursing Home in Manning, Iowa, at the age of 58 years, 9 months, and 18 days. Leroy is survived by his parents, Glen and Velma Huey of Irwin, Iowa; three brothers, Marlin (Barbara) Huey of Ankeny, Iowa, Roger (Janet) Huey of Anita, Iowa, and Tom (Delores) Huey of Kimballton, Iowa; two sisters, Rosemary (Charles) Chisholm of Charlottesville, Virginia, and Sherri McQuaid of Omaha, Nebraska; nieces and nephews; and other relatives and friends. Funeral services were held on Wednesday, February 25, 2009, at the Irwin United Methodist Church in Irwin, Iowa, with Pastor Ted Sieck of the Irwin Church of Christ officiating. Ruth Ann Barry served as the organist. Casket bearers were Ilse Huey, Paul Hiatt, Aaron Huey, Sam Huey, Danny McQuaid, and Gaylin Huey. Burial was in the Oak Hill Cemetery in Irwin, Iowa. The Burmeister-Johannsen Funeral Home in Harlan was in charge of the arrangements. Condolences may be left online at www.burmeisterjohannsen.com. To my classmate, Rosemary, and to the rest of Leroy’s family, I send my condolences. I am so sorry for the loss of a great Guy! Leroy was one of my favorite cousins. My Grandson David told me today that Leroy was my only cousin that he really could remember and had fun with.